Far Right Marches in Brussels Against UN Marrakech Migration Pact. Not only British Brexiteers are anti-Immigration: Our People First! (Vlaams Belang). Thousands of demonstrators in Brussels have marched against a UN migration pact, signed in Marrakech last week. 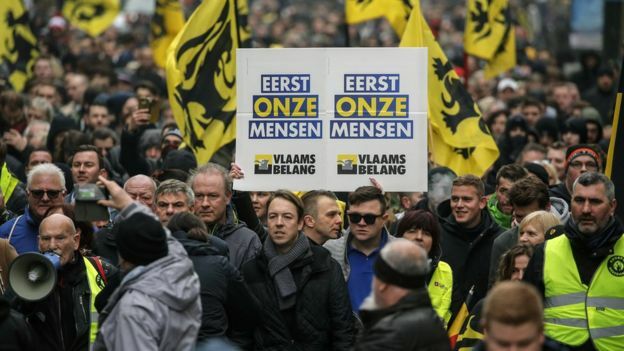 Flemish right-wing parties called the march, which took place near major EU institutions, amid fears the pact could lead to an increase in immigration. Police deployed tear gas and water cannon as clashes broke out. About 5,500 protesters took part. 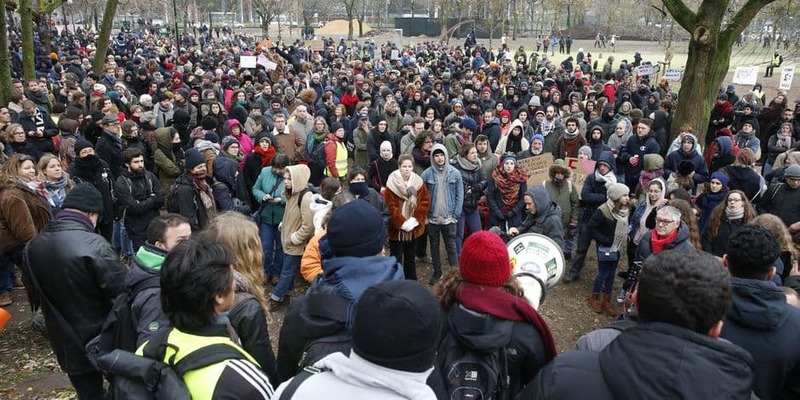 A counter-protest organised by left-wing groups and charities in the city centre drew about 1,000 people. The largest member of Belgium’s ruling coalition, the right-wing N-VA party, left the government last Sunday in protest against the prime minister’s decision to sign the agreement. The far-right, principally the Vlaams Belang headed nebuleuse, KVHV, NSV, Schild & Vrienden, Voorpost and Vlaams Belang Jongeren, are trying to out bid the N-VA of Bart De Wever in opposition to the UN agreement. La Libre Belgique also reports that a section of the Gilets Jaunes in Belgium joined the anti-racist protest, after strong attempts by the Vlaams Belang and the N-VA to win them to anti-migrant stand. The local election breakthrough of the radical left Belgian Workers’ Party. Sunday’s local election results in Belgian saw a breakthrough in the French speaking areas by the Green Party (up by 4,42%) and in Antwerp ( 18,4 % for De Groen),and a big rise in support for the radical left, le Parti du travail (PTB) Partij van de Arbeid van België, PVDA. The latter scored 15, 8 % in Charleroi, in 16,5 % Liège 8,9 % à Anvers, 11,6 % in Bruxelles ville and 13,6 % in Molenbeek. (le Monde). In Brussels, the Ecolo/Groen party registered historical gains, coming first or second in several local councils, including Ixelles and Forest, where it displaced the ruling socialist party. The leftist PTB was the other big winner, although they weren’t expected to enter ruling coalitions in any of the 19 “communes” of Brussels. The main loser in the capital of Europe is the right-wing MR, the party of Prime Minister Charles Michel, which was challenged in its Uccle stronghold by a rising Green wave. Elsewhere in Brussels, the socialists registered a symbolic victory in Molenbeek, where they beat MR incumbent Françoise Scheepmans, who came second despite winning praise for her handling of the Brussels terrorist attacks of 2016. In Flanders, the separatist N-VA (New Flemish Alliance), which advocates the gradual dissolution of Belgium, solidified its leadership although the Green party made gains there as well. The N-VA’s leadership was also challenged by the far-right Vlaams Belang, which won the commune of Ninove near Brussels, where the Forza Ninove list of Guy D’Haeseleer came in as a clear winner. A number of papers highlighted the election of the first Black mayor in Belgium, Pierre Kompany, the father of Vincent Kompany, the captain of Manchester City , in Ganshoren (De Standaard). For the left the results for the Parti du Travail (PTB) – which claims around 10,000 members – are of interest across Europe. The PTB begins by noting that they have gone from 50 to 157 local councillors. These are concentrated in French speaking districts but the PTB has some representatives in Flanders, and won 8,7 % in Antwerp and got 4 seats on the City council and 19 seats on district councils. Their President, Peter Mertens, declared that they will celebrate this advance, and called for The Struggle. Nous nos élus et notre parti seront au service des luttes locales et nationales. Notre avancée doit se traduire par une avancée de la résistance social. Our elected representatives and our party will put themselves on the side of local and national struggles. Our gains must lead to strengthening the fight-back in society. The most important fact about the success of the PTB is it has happened in a country, Belgium, in which the two sister social democratic parties the Parti socialiste, and the Socialistische Partij Anders, have never faced a serious challenge from the left. Even if weakened the PS won 32% of the vote in the previous elections in the south of the country. It is through these struggles that they intend to fight not just the ruling capitalist neoliberal political class but also the far-right. The PTB also rejects the principle (follow my gaze…) that they should be run by a charismatic leader, (“césarisme ou l’idée de l’homme providentiel”). Councillors live in the areas they represent and are expected to only take an average salary for their work). Their strategy is not to govern at any price, but to conquer real power, from the bottom upwards – which one translate as a homage to Léon Blum who distinguished the ‘exercise of power’ in government from the conquest of power. To account for the growth in electoral support for the PTB in formerly socialist voting areas one need look no further than this compendium of corruption and other scandals involving the PS over decades. More recently (2017) there was this: En Wallonie, le PS éclaboussé par un vaste scandale. PS elected representatives were paid 500 euros… à la minute to attend meetings….. Returning the the issue of ‘populism’, what are the PTB’s views on Europe? The Left must not fall in one of these two traps. As a Marxist, and coming from an authentic leftist tradition, I think we have to try to radically change Europe from the inside. We should not dynamite the entire European idea, but, like an engineer working on a bridge, dynamite the bad columns. Defending a position of withdrawal from the European Union in Belgium, at the heart of Europe, is not going to raise public awareness a lot, I think. The situation is obviously different in countries at the periphery of the continent, and I understand that for them the possibility of leaving the eurozone, can be a topic of debate. Promise on the Belgian Left An Interview with Peter Mertens. That comment stands out in a an interview in Jacobin in 2017, with one of the leading figures of the PTB. One cannot however, like the interviewer, skirt around the issue of the party’s ‘Marxist-Leninist’ origins nor their defence during the 1980s of Stalin. Ludo Martens (PTB President from 1979 to 1999) was the author of Un autre regard sur Stalin, Another View of Stalin. At the end of the twentieth century, humanity has sort of returned to the start state, to the years 1900–1914, where the imperialist powers thought that they could run the world among themselves. In the years to come, as the criminal, barbaric and inhuman character of imperialism shows itself more and more clearly, new generations who never knew Stalin will pay homage to him. Mao Tse-Tung, `Stalin, Friend of the Chinese People’, Works, vol. 2, p. 335. It is hard to forget that. Historic Gains for Greens and Radical Left Workers’ Party in Belgium Local Elections. Greens and Radical left on the Rise in Belgium. Greens and other smaller parties hammered traditional political heavyweights in local elections Sunday in Belgium, in what has been billed as a rehearsal for next year’s federal and European elections. 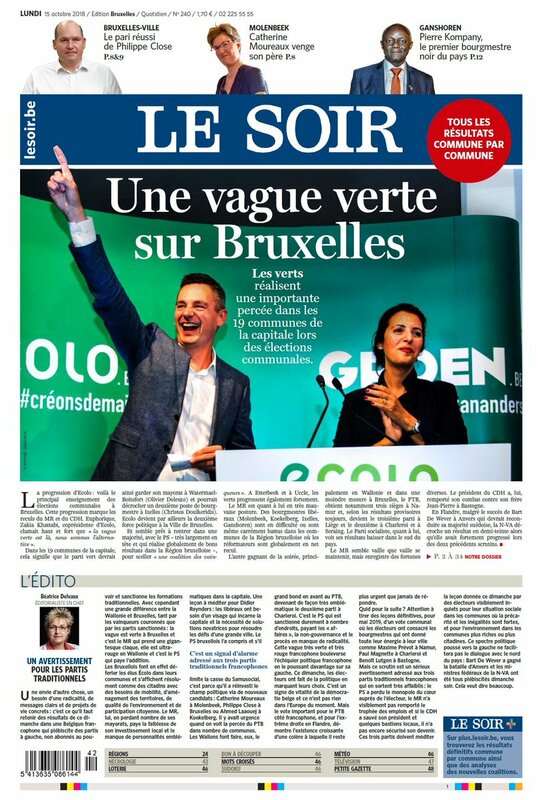 In Brussels, the Green party Ecolo-Groen made a breakthrough in the local ballot, finishing first and second in a number of local councils. Overall, the party led by Zakia Khattabi and Patrick Dupriez, finished first in four Brussels Region districts, including the EU district of Ixelles, and won up to 29 percent of the vote in other districts. These results could lead the party to having a number of mayors in the Brussels region, where they currently only have one, in Watermael-Boitsfort. The election’s other big winner in the Belgian capital was the leftwing Workers Party (PTB/PvdA), especially in the city’s former industrial districts. The pro-sharia Islam Party lost its seat in Brussels’s Molenbeek district, winning less than 2 percent of the vote. In Flanders, the Greens also made gains, although the separatist New Flemish Alliance (N-VA) — which advocates for the separation between French-speaking Wallonia and the Flemish Flanders — maintained its leadership there. The ruling socialists remained dominant in French-speaking Wallonia but they were challenged by the rising PTB/PvdA in a number of local town halls. Commentators say these elections are a mirror for the national, regional and European elections to be held in Belgium in May. The French version of the France 24 article points out that in the Flemish areas also points out that extreme right anti-immigrant Vlaams Belang has returned with a strong showing. Le Vlaams Belang, le parti anti-immigration qui concurrence la N-VA sur sa droite, a enregistré un retour en force dans plusieurs cités flamandes et a revendiqué la place de 3e force politique de la région, derrière les chrétiens-démocrates du CD&V. Le Monde notes that the Workers’ party, le Parti du travail (PTB, gauche radicale) scored 15, 8 % à Charleroi, 16,5 % à Liège. Le parti marxiste réalise aussi 8,9 % à Anvers, 11,6 % à Bruxelles ville et 13,6 % à Molenbeek, où le PS lui propose une alliance, alors que la direction du parti condamnait jusqu’ici les positions jugées populistes de cette formation. Michel Collon, Conspiracies, Political Confusionism and…… Steve Hedley (RMT). Michel Collon, Conspiracy Theorist and Confusionist. Michel Collon is a member of the Parti du travail de Belgique PTB (English here) and sits on its central committee. This party, which counts around 10,000 members, has 47 local councillors and 2 MPs in the Federal Parliament and a number of other representatives, and at present is said, according to opinion polls to be the second largest political force in Wallonie. It is of a ‘Marxist-Leninist” origin, that is pro-Chinese ‘Maoism’, publishing in 1994 a book in support of Stalin, Un autre regard sur Staline (éditions EPO) and supported Kim Il Sung. Since 2008 it claims to have become an “open” party, turned towards electoral campaigning as a party of the working class, with references to other European lefts from different traditions, including the Portuguese Communist Party (Parti du travail de Belgique : du maoïsme au parlementarisme ?). It’s success in the last year owes a lot to the massive corruption scandals affecting the Belgium Parti socialiste and the PTB’s ability to carry out grass-roots campaigns on immediate issues such as public services. Collon has his own past which includes, “Il a participé à la conférence “anti-impérialiste” Axis for Peace, organisée en 2005 par Thierry Meyssan du Réseau Voltaire“. That is he took part in a conference held by the far-right, conspiracy (9/11 Truthers) Meyssan and the Réseau Voltaire which has been accused of anti-Semitism. It is at present, pro-Assad in Syria. In 2015 Collon claimed that the murderers of the Charlie Hebdo and the Hyper-Cacher were armed, trained and indoctrinated by French Socialist Minister Laurent Fabius as part of the war in Syria and Libya, “en réalité, ils ont été armés, formés militairement, endoctrinés par Monsieur Fabius et ses amis ; qui ont envoyé pendant trois ans des milliers, des dizaines de milliers de frères Kouachi, faire encore pire qu’à Charlie, en Syrie et en Libye. ” (Michel Collon sur les attentats de Charlie Hebdo : « les frères Kouachi ont été armés par Fabius »). Collon now runs a web site, Investig‘Action (founded in 2004) which publishes in French, Arabic, Italian, Spanish and (American) English. It is a classic “conspi” site, whose aim is as follows, “Investig’Action’s mission is to provide an alternative point of view about the world news and denounce medias’ lies. How did the Western media cover the various wars that followed the first Gulf war? Are there similarities regarding the way the media covered each of these events? Are there major “war propaganda” principles? Yes, there are. Hiding the interests. Our governments fight for human rights, peace, or whatever noble ideal it might be. A war should never be presented as a conflict between divergent economic and social interests.Each war must be preceded by a spectacularly big media lie in order to win public support. And after that, keeping on demonizing the enemy, especially by showing continually pictures of atrocities the latter committed.Hiding History. Hiding the historical facts and geography of the region, making local conflicts that are stirred, or even provoked by the Great Powers themselves, incomprehensible. Organizing the amnesia. Avoiding any serious reminder of past cases of media manipulation – it might make the public too suspicious. Q: Why do you think the western countries are trying to use people against Iran and not use military force? What is the difference?. In spite of everything, and paying the price for it, the People’s Republic of Korea has remained sovereign, counting only on its own capacities, creating a spirit of uncompromising resistance to this day, blending in its ideology Marxism and Confucianism, in which journalists from the great Western press do not have the least bit interest. I think we can guess before reading what their views on Israel and Zionism are. Two stories reported by Haaretz on Wednesday underscore the unchanging goal of Zionism: the destruction of the Palestinians as a people and as viable communities, and the theft of their land for exclusively Jewish colonial settlement. The site has received numerous criticisms from the French speaking left including this, Michel Collon, un militant de la confusion ! (2014) which amongst other descriptions in the same vein calls it an “une imposture journalistique”. Ornella Guyet notes that Collon has attended events, alongside figures from the far-right, to support the following, “Mouammar Kadhafi et de Bachar Al-Assad”. Steve Hedley is a former member of the Socialist Party (resigned in 2013). He is Senior Assistant General Secretary of RMT (National Union of Rail, Maritime and Transport Workers. An active campaigner for leaving the European Union he attended the ‘European’ Rally of the small Trotskyist party, the Parti ouvrier indépendant démocratique (POID) in May 2016. He has now found another odd far-left crew to talk to, Investig’Action. Brexit, Corbyn and trade unions: interview with Steve Hedley (January the 14th 2018). Responding to the question as to why he and his union are against the Eu Hedley replies. Very simply, because the European Union was and is a rich man’s club. It was set up as a bulwark against the Soviet Union. NATO was the military arm and the European Union was the economic arm. It’s a trading bloc that is competing against other trading blocs. If you look at the history of the European Union, it has free movement of capital, free movement of labour, and a neoliberal economy written into the treaties. Therefore to be part of the European Union is to accept all of those things. More grist to the mill of Collon’s conspi site. 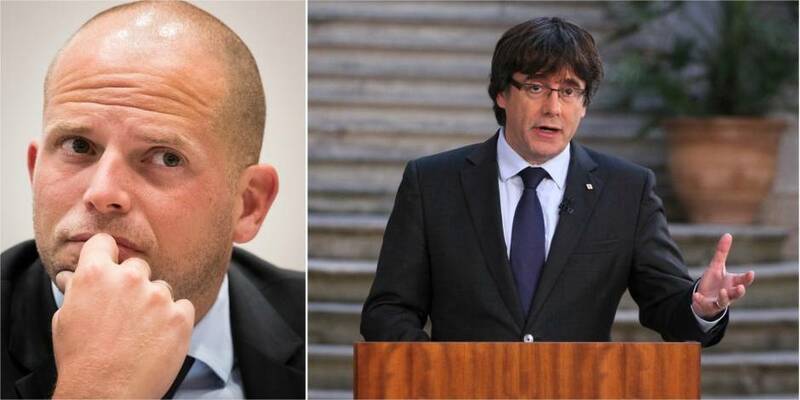 Far-Right – N-VA – Belgian minister: Catalan Leader Puigdemont can seek asylum here. Belgium Far-Right Flemish Separatist Minister Francken offers Puigdemont Asylum. Quand Theo Francken embarrasse le gouvernement dans toutes les langues. Le Soir. A Belgian minister said Catalan ex-President Carles Puigdemont, removed from office by the Spanish government last week, could apply for asylum in Belgium. “Catalan people who feel politically threatened can ask for asylum in Belgium. That includes President Puigdemont. This is 100 percent legal,” Theo Francken, the state secretary for asylum and migration, told public broadcaster VRT late on Saturday. This has immediately been rejected by the Prime Minister of Belgium as adding fuel to the Fire. Francken prêt à accueillir Puigdemont en Belgique, Charles Michel demande de ne “pas jeter d’huile sur le feu”. Nieuw-Vlaamse Alliantie, N-VA) is a Flemish nationalist and conservative political party in Belgium, founded in 2001. The N-VA is a regionalist and separatistmovement that self-identifies with the promotion of civic nationalism. It is part of the Flemish Movement, and (This bit is not coincidence whatsoever) strives for the peaceful and gradual secession of Flanders from Belgium. Its best known member is their leader Bart De Wever. In October 2014 several political parties demanded Francken’s and Ben Weyts‘ resignation after the two were present at the birthday of Bob Maes, a former member of the Vlaams Nationaal Verbond, a party who collaborated with the Nazis in the Second World War. In the same month Theo Francken also came in stormy waters after the leaking of some old mails with allegedly homophobic statements and a Facebook post where he questioned the “added value” that immigrants from Morocco, Congo and Algeria bring to the Belgian economy. Subsequently, Theo Francken apologised in the federal parliament. Spectacular Rise in Polls for Belgium Far-left Parti du Travail de Belgique/Partij van de Arbeid van België. Le PTB, futur lider maximo? Le parti marxiste progresse dans les trois régions du pays, même si cela reste mesuré en Flandre (+1,4% pour +5,6% à Bruxelles et + 12,9% (!) en Wallonie). Tel est à nouveau le principal enseignement du baromètre Dedicated pour la RTBF et La Libre. Autres vainqueurs: le Vlaams Belang et Groen! qui, en Flandre, font toujours jeu égal avec les partis traditionnels. The PTB future lider maximo? The Marxist Party has risen in the opinion polls in three regions: up 1 % in Flanders, 5,6% in Brussels and plus 12,9% in Wallonie. This is the result from the latest poll by Deciudated, for the RTBF and La Libre. The other winners are the far-right Vlaams Belang and the Greens, Groen!, who in Flanders are neck and neck with the traditional parties. La Libre Belgique says that the Workers’ Party of Belgium (Partij van de Arbeid van België, PVDA; Parti du Travail de Belgique, PTB) is scoring 18,4% of voters amongst voters in Wallonie. The PTB/PVDA is a Marxist political party with its roots in ‘marxism-leninism’ (Maoism) about which there is much to say. It is one of the few parties that operates as a single Belgian party. Site (French): here (Flemish): here. Wikipedia notes that the PVDA-PTB hosts the International Communist Seminar, which in recent years has become one of the main worldwide gatherings of communist parties. Also see: Le PTB convainc 18% des électeurs en Wallonie Le Soir. 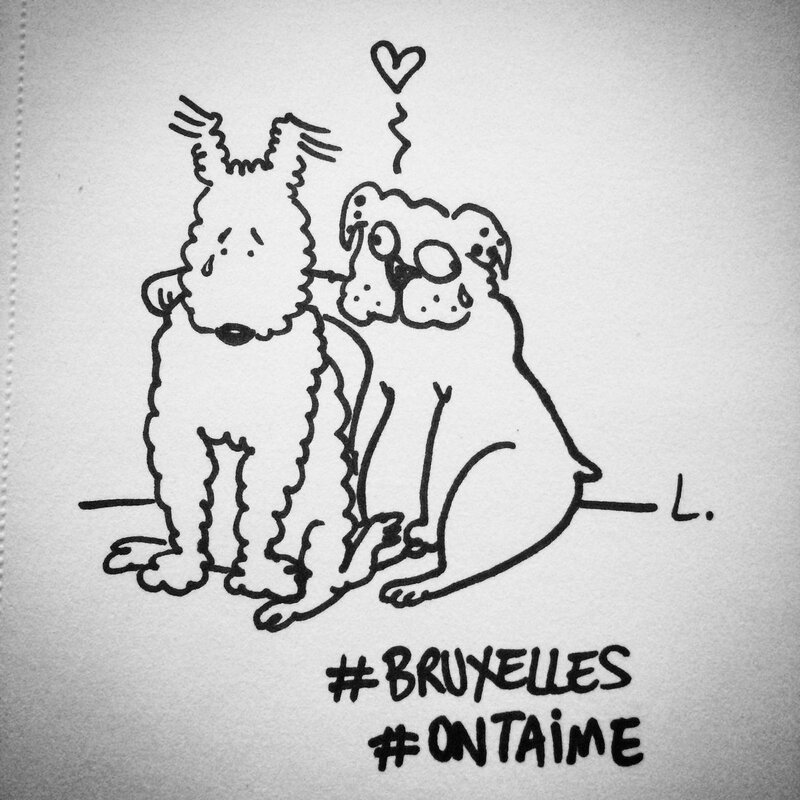 Like many people I love Brussels. The city and the people have a gentle warmth that remains within you for a long time. Not all of the vast conurbation, but enough of it to make today’s attacks leave deep wounds, and rouse profound feelings of solidarity to those affected. Ukip defence spokesman Mike Hookem went further, saying that the attack were a “result of Schengen free movement and lax border controls”, adding: “I am appalled at the loss of life and injuries. our thoughts and prayer go out to the families of those killed and injured. “This horrific act of terrorism shows that Schengen free movement and lax border control are a threat to our security. “The head of [Europol] said in February that 5,000 jihadists are at large in EU having slipped in from Syria. Speaking on LBC, Ukip’s London mayoral candidate Peter Whittle also linked the attacks to the EU debate. He said: “We have to take control of our borders, this has happened as a result of people going over borders and having free movement. Others, including Ukip spokesperson Michael Heaver, also joined in. Brussels Attack: Ed Miliband Hits Out At Brexiters Using Terror Attacks For ‘Political Capital’. After a Labour In event this morning, in which Miliband urged his parties voters to back Remain in the June 23 Referendum, the former party leader said: “All of us have been deeply shocked by what we’ve seen unfolding in Brussels today. This is a place where my dad was born I think it’s an awful, awful and terrible situation. “On a day like this I really don’t think it’s a day for either side in this referendum to try and use this terrible tragedy to make political capital. As the death toll rose amid continuing rescue operations, Isis supporters were championing the attacks on Twitter. 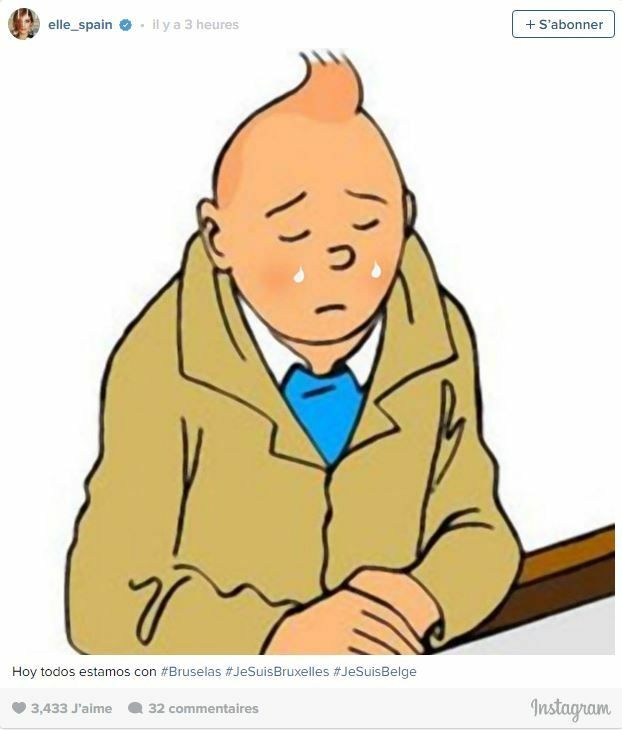 “What a beautiful day today,” one man wrote, calling the victims “Belgium supporters” who did not count as civilians. “F***. Belgium Belgium wanted to bomb the Islamic state Now enjoy what your hands have sown. In Arabic, the hashtag #Brusselsonfire was being used by those praising the slaughter in a similar wording to the #Parisonfire trend seen when the French capital was hit.